We love the recent trend of using greenery and oversized florals in many wedding décor designs, but there’s another stunning reception décor idea we must introduce for brides who really want to make a statement: The Hanging Wedding Cake! These four hanging cake designs caught our eye recently, and we are so in love with this idea we simply had to share it here on the blog! 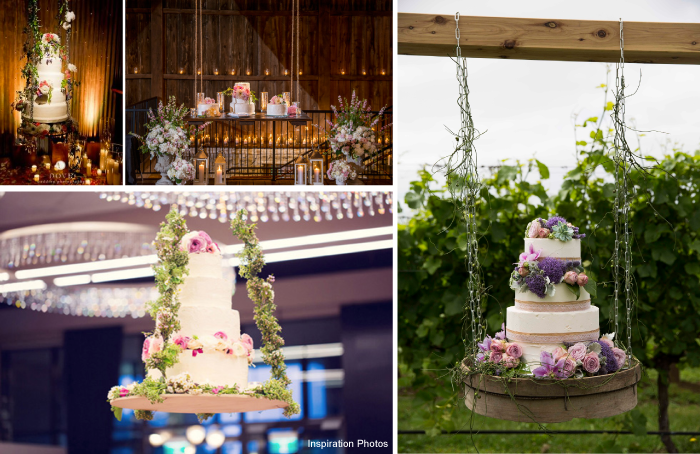 All of these hanging cakes include plenty of lush florals and greenery, so this look is perfect if you’re following the trend and bringing the garden inside on your wedding day! Hanging cakes might look difficult to pull off, but your professional Cabo vendor team knows all the tricks of the trade and we can make your cake display stand out among all the rest! Love this look? Follow our blog for an upcoming real wedding featuring the hanging cake design! This entry was posted in Accessories and decor, Cabo event design and decor, Cabo Flowers, Cabo Wedding planner and coordinator, High end set-ups, Special Event Decor in Cabo, Wedding Inspiration, Weddings and corporate events decor and tagged CABO EVENT RENTALS, Cabo garden wedding, Cabo green wedding, Cabo rustic wedding, Cabo statement wedding, Cabo vendor team, cabo wedding, Cabo wedding design, Cabo wedding greenery, cabo wedding inspiration, Cabo wedding planning, Cabo wedding trends, Cabo wedding vendors, destination wedding Cabo, Event decor, hanging wedding cake, high end wedding, wedding cake table, Wedding design, wedding flowers. Ashley and Jeremy – February 6th, 2016 – Hacienda Casa y Cocina.